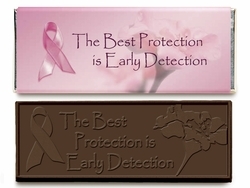 Our Breast Cancer Ribbon Chocolate Bars and Candy Bar Wrappers are the perfect addition to your event. Enjoy our Belgian DARK chocolate candy bar while fighting a cause you so believe in! Each bar measures 5x2" (1.2 oz) and will melt in your mouth! The chocolate is imprinted and molded exactly the way you see it on the candy bar wrapper. Please allow 2 full weeks to arrive. If you need it sooner, please place rush order. **please note that during the months of May-Sept chocolates need to ship 2 day air to prevent melting in transit.